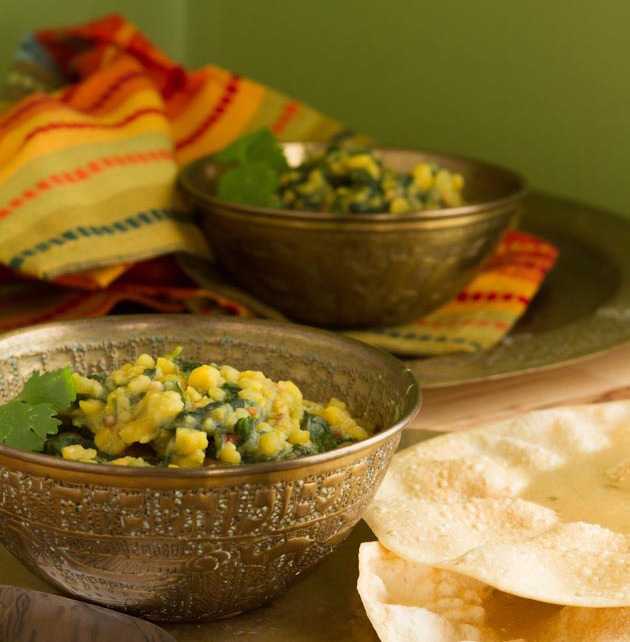 A super simple, healthy Indian recipe made with yellow lentils, spinach and spices. Add water, lentils, turmeric and salt in a medium-sized saucepan. Bring to a boil, reduce heat to low. Cover and cook for 25 minutes, or until lentils are soft. Drain excess water, reserving 1/4 cup. Return lentils back to saucepan along with reserved cooking water. Mash lightly with a fork or potato masher and set aside. Meanwhile, in a separate pan, saute coconut oil with garlic and ginger. Add chopped spinach and cook for 1-2 minutes until lightly wilted. Add spinach to lentil mixture along with chillies. In the same pan you sauteed the spinach in, add tempering ingredients and heat on medium-high until seeds begin to pop and get golden. Drop tempering into lentil mix and stir to combine. Return lentil mixture to the heating element and cook, covered on low heat, for 5-10 minutes. Stir in lemon juice and fresh cilantro.